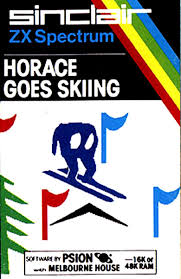 Horace Goes Skiing was the first time I can remember feeling that addictive streak kick in. You had to walk across a road like in Frogger, then you got to ski and score points. Getting across that road was no mean feat! This was the reward. The thing about a 48k was that the games came on cassettes. You had to plug a tape recorder into the machine and load the game off the cassette. This procedure usually took a couple of minutes as long as the machine co-operated. Sometimes you’d have to try it out several times in order to get it to work. From Horace, I moved on to Manic Miner; a platform puzzle game that was incredibly addictive and ridiculously hard in places. I never finished it! I never finished the sequel, either: Jet Set Willy. This was an insanely large platform game in which, as Miner Willy, you had to collect up all the bottles in your mansion after a big party. I mentioned loading your game before and this one had an added kink. It was one of the first attempts to avoid piracy. Since these games were on tape (as shown below), they could very easily be copied. The manufacturers’ trick was to include a piece of paper with a code on it. It was a colour code and unless you had the piece of paper, you wouldn’t be able to give the correct response to the prompt at the start of the game. This could, of course, be copied just as easily as the tape. All we had was a black and white photocopy of it though, so it took some creativity guessing what colour was what!! R-Type was a fantastic, sideways scrolling shooter with a ship that you could add all sorts of cool weaponry to. Renegade set you up against gangs of thugs in different flavours that you had to punch and high-kick your way past. You could even fly-kick dudes off motorcycles. Back to Skool was a school simulator where you could hide mice in people’s desks and write stuff on the blackboard. You had to pray you didn’t get caught, though! Atic-Atac was a bird’s eye view game where you could play a knight or another character and run around a castle looking for objects, trying to avoid The Mummy, Dracula and Frankenstein. Barbarian was a sword and sorcery game where you could decapitate your enemies with a well-timed hit. This was one of the first games I discovered where there was a glitch which allowed you to win easily every time. If you forward rolled your enemy into the corner of the room, you could repeatedly chop at their ankles and they would be powerless to stop you. It didn’t make for a very thrilling game after that, so I just spent the time wearing them down until they were almost dead, and then going for the head chop to finish them. Robocop had a similar glitch on the Spectrum. Not for all of the game, just what was meant to be the hard part. When you came up against the fearsome ED-209, all you had to do was duck at the right time and it would never hit you with its shower of bullets. It was also courteous enough to stand still for the duration of your battle. Johnny Reb was… I can’t even remember how you played this. It was a US Civil War simulator of some kind. Last but not least, there was the keyboard/joystick destroying game that was Daley Thompson’s Decathlon. The 100m sprint, especially, would cause irreparable damage to your keyboard or joystick over time, such was the fury with which you were expected to bash it in order to break the record. We experimented with other Sports compilation games on the Spectrum, like Gold, Silver and Bronze but these never lived up to the playability of Decathlon. 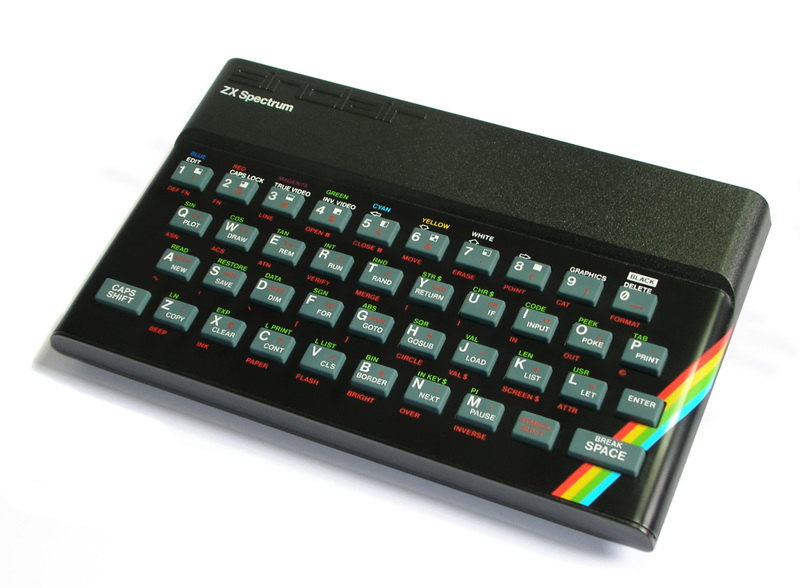 All this gaming on the spectrum was in sharp contrast to what others were doing at the time. My friend Philip had a Commodore Amiga and that had much better graphics. The pinnacle of arcade gaming at the time was Hard Drivin’. This was a game where you had to pretty much sit in and drive a car with gears and everything! Wow. Marvel at the cutting edge technology. I don’t remember being too impressed at the time. It was too much like hard work. I much preferred playing Narc. At least in Narc you could shoot loads of identical dudes in long raincoats and pick up the money they dropped. Failing that, there was the brilliant vector graphics Star Wars arcade game that swallowed quite a lot of my pocket money as I attempted the trench run! My spectrum-playing days ended with my relocation to the South aged about 16. It would be about 5 years before I did any home gaming again. The graphics were a big change from what I was used to. Things had come quite far in a few years. Madden 97 was a nice American Football simulator with another fatal flaw: the HB toss. Chuck the ball out wide to your running back and he could run around the defence and pick up about 20 yards each play. Always a useful move to fall back on if you needed to get quick points. Fifa 98 was the first football game that I got really good at. You could up the money at your club to such a ludicrous level that you could literally assemble the Harlem Globetrotters of International football. Not Ronaldo, however. They mustn’t have had the rights to his name. There was just a big, similar-looking chap called ‘Calcio’ in his place! One of my favourite games for the original PlayStation was Syphon Filter, a third-person spy story with a good degree of action and an interesting plot, reminiscent of the Mission: Impossible films. It wasn’t until I got a Playstation 2 that I entered the cultural behemoth that it Grand Theft Auto, A friend of mine had one of the first versions, where you had a bird’s eye view of the action. I never had Vice City or anything like that. I remember watching a trailer for GTA: San Andreas on TV and thinking I had to give it a go and see what all the fuss was about. It had a fantastic look to it and a very immersive story. Not so much the main plot, but all the little side quests and requirements: getting new clothes, working out, getting a haircut, tagging walls. Progressing through the game, it was lovely to unlock different parts of the map as you went. That first time you drove into the game’s representations of San Francisco (San Fierro) and Las Vegas (Las Venturas) was quite breath-taking. I almost gave up on it really early on, though. There was some task that involved driving a forklift while people stood around and shot you repeatedly in the face. Suffice to say I was dying many times and shelved the game for a while. It was only after a week or so that I learned that you could step out of the forklift and deal with your attackers before carrying on. I loved the car theft mission where you had to look out for every different brand of car, some of which were extremely rare in the massive open world environment, and then steal them all. I had garages stuffed full of cars in San Fierro, ready to be dropped off by crane onto a waiting tanker. There was also a mission involving a remote controlled aircraft (the last story mission I completed) which drove me to the verge of console-icide. Eventually, I got through it and then set about working towards the 100% completion stat. I had a jetpack, so I was able to zip from place to place and paint all the tags, take all the pictures required. The absolute last thing on the list was the firefighter mission. I remember doing it in one of the countryside fire stations so that there would be less traffic and people to get in the way. This paid dividends until the very last person, a flaming man who I had to douse with the hose, managed to climb up the sheer face of a cliff. My brother watched as I desperately tried to drive up the cliff in my fire engine in order to get a good enough angle to put him out before he died. Success! I’ll always remember San Andreas fondly. I never quite got the same feeling with the ensuing games despite playing them through. They do all follow something of a pattern and the missions start to blend into one another. The graphics have improved immeasurably however some of it feels a bit soulless. I followed that up with a little Resident Evil 4. I’d played the first three games back on PlayStation but this was my favourite incarnation of the game. It managed to blend action and pace with some genuinely creepy moments. Plus, there was the merchant – “Ahh, I’ll buy it, at a high price! !” “What are ya sellin’?” Say no more. I recently went through it again on Xbox 360 and it’s lost none of its charm. I also played games on my PC occasionally. Despite the hours of my life which I will never get back playing Football Management simulators (never, never again) I also had a little dalliance with something called the X Universe. These were space exploration, trade and war games with a focus on building a fleet and making money (the one pictured above is X3 Terran Conflict). This tapped into my desire to be a space wanderer in the mould of Malcolm Reynolds or Han Solo. Some of the vistas and ship designs were fantastic and I loved the free rein you had to explore and trade. I reached a limit, however, to how much time I was willing to invest in it. Eventually, I switched platforms to Xbox. I bought a 360 and things got even better. Bioshock was a fantastic game set in an underwater city. There was a beautiful Art Deco feel to the visuals and a fantastic soundscape. It was also a very enjoyable story. Probably my number one gaming experience of all time is the original Mass Effect trilogy. In my view, and you can check it out in more detail in my Comparing Universes post, it stands easily alongside some very lofty competition in the cinema. Really, the last game I played, and the last one I want to talk about in this post, was the brilliant and underrated Alien: Isolation. It quickly took a place in my top three or four games of all time. The loving attention that the developers put into creating an atmosphere exactly akin to the original Alien film was astounding. Couple that with the fact that I’ve never had my nerves shredded quite so frequently as when I was trying to crawl around and avoid the monster and this was a real winner. I spent two thirds of the game hiding in cupboards or under tables. Playing this game with the lights off is a serious jangler of the old nerves and a very rewarding experience. It’s been a couple of years since I did it and I think it’s high time I had another run through. I read somewhere that the gaming industry is worth more money than film and music combined. So often, I’ve come up against people who think they’re a complete waste of time or just for kids. To be honest, I like to maintain a balance. I don’t see gaming as any more or less worthwhile than any other form of escapism. It’s somehow socially acceptable to go on a Netflix binge and watch and entire series of something, but if you were to spend the time on a game, some of which are put together with far more care and detail, you’d become some kind of social leper in certain circles. For me, when you get immersed in a really good game, the interactive nature of it is more rewarding than being the passive observer in front of the TV. That’s not to say people can’t take things too far, but then you could say that about just about anything. I can’t wait until the next game comes along that captures my imagination the way some of these have. My son will need an Xbox One or whatever’s new in a few years so he can keep up with the other children at school, so I suppose I’ll have to go out and get one. That’s a potted history of my life as a gamer. Thanks for reading. If you enjoyed it, please feel free to check out my other entries in the Blogging from A to Z Challenge. I’m building up quite a picture of myself.